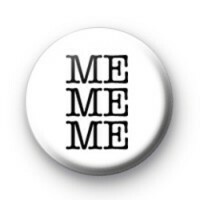 A white button badge with the text Me Me Me written horizontally in three rows. This badge is a lot of fun and perfect for those who think it's all about them. Standard 25mm button badge made in our UK workshop using metal badge components and manual badge presses.